GM Rapport an exiting draw with Vachier-Lagrave started in round 1. Maxime Vachier-Lagrave and Richard Rapport discuss their round 1 game with Daniel King. This is the seventh edition of LCT organized by Jan Bey. Over 20 titled players participated, from which nine were grandmasters. The tournament started on July 12 and ended on July 19. 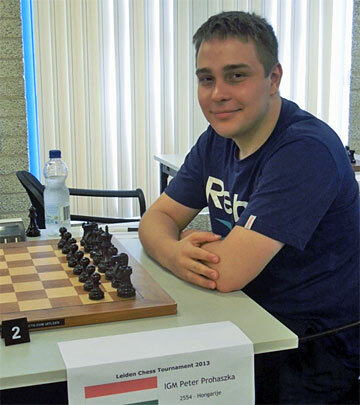 It was a nine-round Swiss and was held in the Mind Games Center of Leiden. People from twelve countries came to the lovely Dutch city. During weekdays the games started at 19.00h, so that people with a job would not have to take any free days. For players from abroad this offered ample opportunities to go sightseeing. GM Drazic won with 7/9. GM Balog and WIM Domany finished with 5/9. Posted on July 23, 2013, in Rapport, TWIC summary 2013. Bookmark the permalink. Leave a comment.